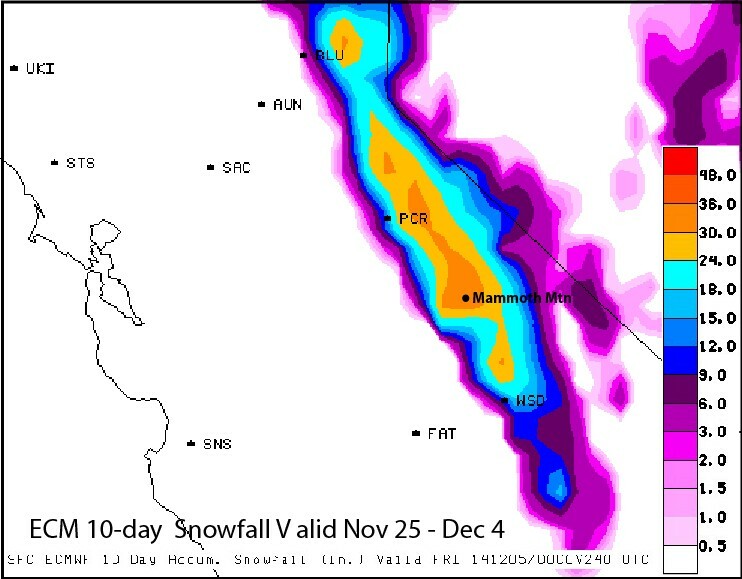 Mammoth Mountain, California 11-30-14 – 9AM – We are still expecting a chance for a 2 – 3+ foot plus dump up on Mammoth Mountain Tuesday in early Thursday morning. This incoming storm is a bit warm for this time of year, but that is good for base building and that is what Mammoth needs to get the show rolling for real. Snow levels are forecast to be around 8000 feet for Tuesday and then drop Wednesday to around 7500 feet. At the start of the storm we could see higher snow levels for a period of time. We have been watching weather models for days and 2-3+ inches of water content seems like a reasonable call at this time. Get the details of the first big storm of the season heading towards Mammoth…. 11-25-2014 – 6:38AM -Welcome to MammothSnowman.com. If you are new to our web site we are glad to see you here. Our goal here is to provide you with the most accurate snow conditions and weather outlooks possible for Mammoth. We also like to throw in a ton of snow stoke. Bottom line is we tell it like it is so you can decide if you want to make a trip to Mammoth this week with out all the marketing fluff you get from other sources. 11-24-2014 – It’s snowmaking time out on Mammoth Mountain. Snowman took over 100 images today for you’re photo snow report viewing pleasure. 1-22-2014 –7:35AM – The window-cast from out on Mammoth Mountain shows mostly cloudy skies with moderate wind gusts in the area. There is some light rain falling up to MC Coy station at this time. Expect the snow levels to come down quickly to town later this morning. The ski area could pick up an inch of two of fresh snow. There is also a high wind warning posted for today. Look for a west wind around 45 mph, with gusts as high as 70+ mph above 9500 feet today. 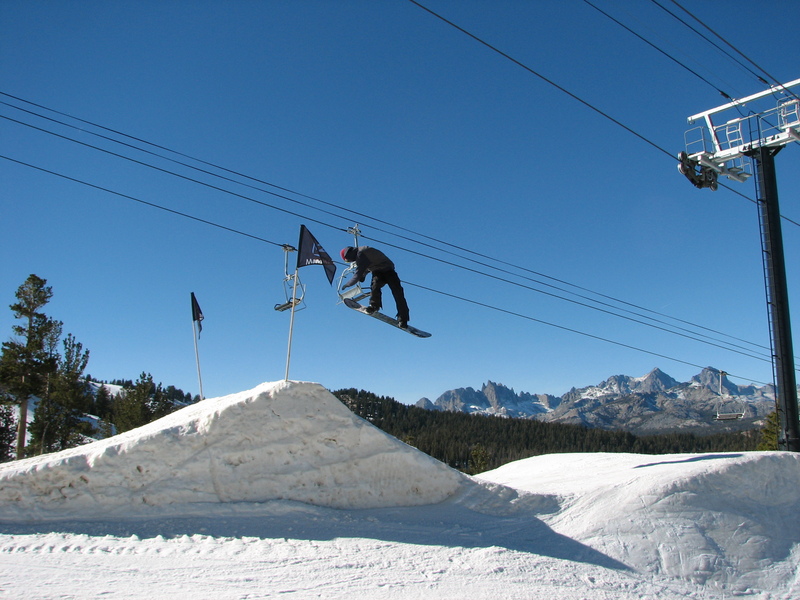 Mammoth Mountain Today – 11-20-2014 – Weekend Update: Snowmaking has been running nightly and into the early morning hours, allowing for more lifts and runs. Lift wise look for chairs 1, 3, 6 and 11 to be open for the season. Runs expected to be open by Friday should be Sesame Street, Broadway, Andy’s Double Gold, Silver Tip, Main Park, The Wall & Saddle Bowl. They are starting to work on Forest Trail, Powder Bowl and upper Stump Alley.